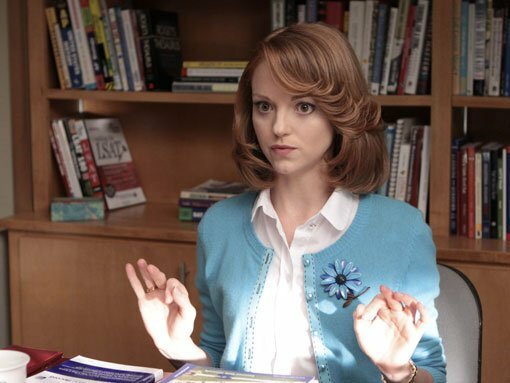 Tinfoil Tiaras - Ottawa fashion blog: What Would Emma Pillsbury Wear? Ok, so I admit that I am slowly dragging behind the Glee bandwagon. Having resisted the urge to watch what I thought was a silly singing and dancing show since it was aired, I have finally caved. And how happy I am! Glee not only encompasses my love of music and cute boys (why wasn't there a Puck in my high school? 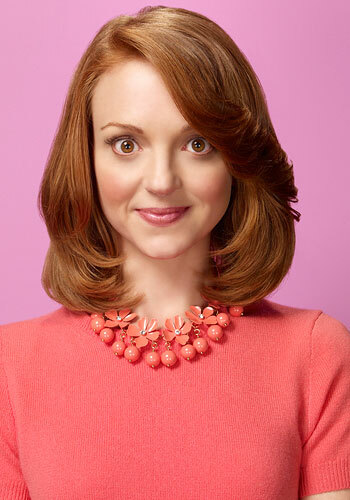 ), it also showcases my passion for fashion with the adorable, innocent and doe eyed Emma Pillsbury. Who else could make those colourful cardigans and grandmother brooches cool? 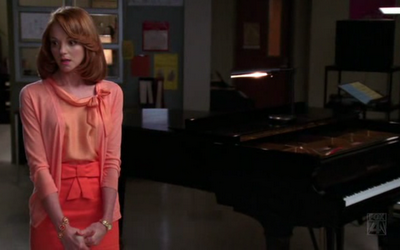 I stumbled across a fashion blog entirely dedicated to the imperative question: What Would Emma Pillsbury Wear? Check it out- they have the inside scoop on where to find those owl sweater clips or Mary Jane pumps you've always wanted! Outfit: Blouse & Necklace- Smart Set; Cardigan- Jacob; Skirt- Thrifted; Heels- Aldo; Brooch-Gifted. How cute! You get close to resembling her, but your natural insouciance shows through. Such pretty colors. I do like her style on the show...& yours too.